3M™. Double-sided separable tape for flying splices. Quick and easy application, ideal for preparing off-line splices for subsequent bobbin storage. The tape separates easily and smoothly. Liner designed for easy removal. Prevents small pieces of tape from detaching or sticking to the rollers. The strong adhesive offers high performance on a wide range of substrates. 3M™. Double-sided separable tape for flying splices. Completely repulpable. Quick and easy application, ideal for preparing off-line splices for subsequent bobbin storage. The tape separates easily and smoothly. Extra high adhesion on both sides. Liner designed for easy removal. Prevents small pieces of tape from detaching or sticking to the rollers. 3M™. Double-sided separable tape for flying splices. Completely repulpable. Quick and easy application, ideal for preparing off-line splices for subsequent bobbin storage. The tape separates easily and smoothly. Liner designed for easy removal. Prevents small pieces of tape from detaching or sticking to the rollers. Permanent double-sided tape, water-soluble acrylic adhesive. Completely repulpable, high cohesion, low thickness, repulpable liner. Individual sealed package. Used for overlapping splices. 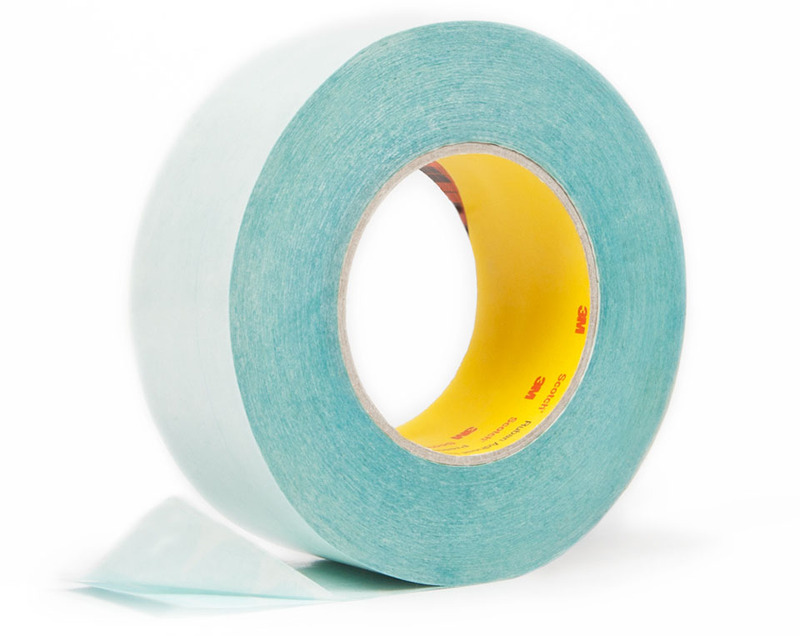 Permanent single-sided tape, water-soluble acrylic adhesive. Completely repulpable, high cohesion, individual sealed package. Available in rally stripe variation (printed with black stripes), red printed (printed in solid red), black printed (solid black). Used for head to head splices. Permanent single-sided tape, water-soluble acrylic adhesive, completely repulpable, high cohesion, single sealed packaging. Butterfly-shaped die cut. Used to temporarily close the bobbin before the flying splice. Permanent single-sided tape, water-soluble acrylic adhesive, completely repulpable, high cohesion, single sealed packaging. Rectangular-shaped die cut. Used to temporarily close the bobbin before the flying splice. Permanent single-sided tape, water-soluble acrylic adhesive. Completely repulpable, high cohesion, individual sealed package. Available in rally stripe variation (printed with black stripes), red printed (printed in solid red), black printed (solid black). Used for head to head splices for lightweight paper.